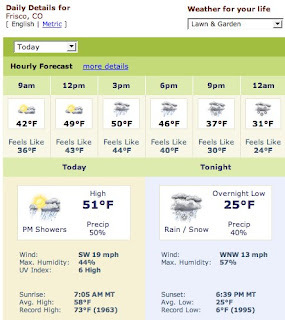 The weather may hold out for the 35 Opens this Am but I'll be pitting for the boys in the 3's and Opens today and the weather looks like it's going to open up on 'em. I've got umbrellas and all for you fellas on the start line. I feel capital T tired today. Probably less from training and more from the season changes. I get these deep sleeps now which is great, but I feel like a diesel motor in the AM trying to shake the sleep. My wife says it's the cavemen in us still that gets the body ready for hibernate mode. I'm looking forward to a CLEAN race these next two days in Frisco. My race. No bobbles, gremlins, etc. Just flow. Wish me luck. If you see any gremlins, run 'em over and squash the little bastards into the dirt. which category are you going to do at the Super Prestige race? I'm gonna try to come out and take some pics and finally put a face to the name. Oh, wait . . . that's Frisco, Colorado. Boy, do I feel dumb. Whatup, Nick?! Indeed, as a former San Franciscan, I would never befoul my lovely City by the Bay by calling it "Frisco." E gads. I recall low riding fart muffler equipped rice rocket 1987 Toyota Celicas with huge stickers on the back windows that said FRISCO. Obviously from Oak-own. HA! Indeed I was speaking of Frisco CO. I'll give a shout out when I am back in SF as I'm there often for work.